In what the New York Times described as the GOP beginning to show “signs of resistance,” on Wednesday, Paul Ryan joined the handful of Republican lawmakers standing up to President Trump’s war on the rule of law — sort of. During a press conference on Wednesday, the House speaker said that while he can’t weigh in on the legality of Trump’s claim that he can pardon himself, he’d prefer that the president not spark a constitutional crisis to find out. “I don’t know the technical answer to that question, but I think obviously the answer is he shouldn’t and no one is above the law,” Ryan told reporters on Wednesday. He also dismissed Trump’s conspiracy theory du jour, without actually uttering the word “Spygate,” by saying he stands by Representative Trey Gowdy. Following a meeting with FBI and Justice Department officials last week, the House Oversight Committee chairman said he’s “even more convinced” that using an informant to investigate potential Russian meddling in Trump’s campaign was entirely appropriate. Ryan’s rhetorical shift is notable, since he’s previously acted as a silent partner in Trump’s war on the Justice Department and FBI, dodging questions while ignoring pleas to rein in the campaign to discredit federal law enforcement officials led by House Intelligence Committee Chairman Devin Nunes. The Speaker also left himself room to eventually backtrack, if he ever discovers evidence that confirms the deep state embedded a spy in the Trump campaign (then craftily declined to use any of the information they collected to keep Trump out of office). Even if there’s no action behind it, Ryan has chosen an odd time to challenge Trump and his allies. Gowdy, once celebrated as the head of the House’s Benghazi investigation, has been viciously attacked by fellow Republicans for pouring cold water on Spygate. Until Wednesday, no GOP lawmakers were publicly defending Gowdy, but Ryan opened the door for party members to openly criticize the president. After Ryan’s remarks, Senate Intelligence Committee Chairman Richard Burr — who was briefed with Ryan and other top lawmakers on the informant last month — said Gowdy’s analysis was correct. Then another Spygate rejection burst forth from GOP Representative Tom Rooney, who sits on the House Intelligence Committee. The GOP is already embroiled in turmoil that doesn’t have anything to do with the Russia probe. The entire GOP conference is set to meet on Thursday to hash out its internal divisions on immigration. Moderates are attempting to force a vote on several immigration bills, including one that would protect young undocumented immigrants from deportation in exchange for border security funding. Conservatives are demanding a vote on a much harsher bill and nothing else, and they’re blaming Ryan for failing to stop the moderates. 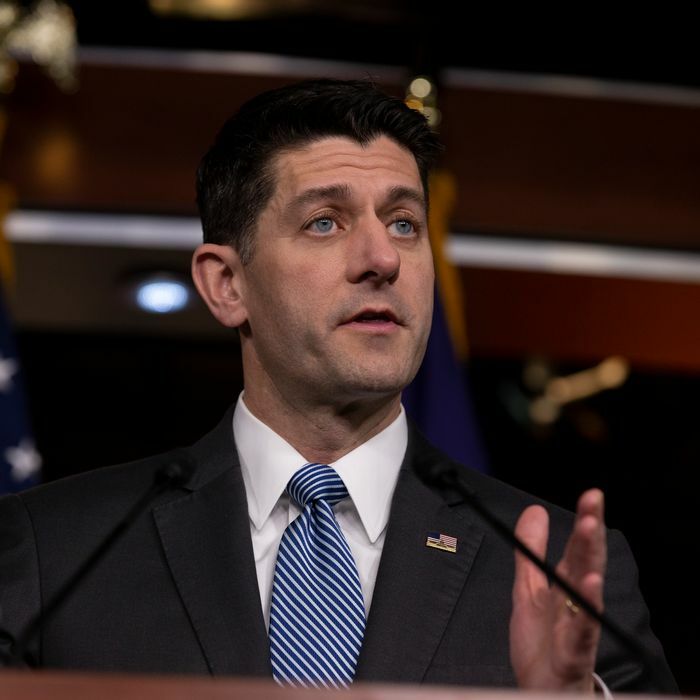 There have already been rumblings about ousting Ryan as speaker before the end of his term, and on Wednesday conservatives incensed by Ryan’s Spygate rejection pushed the discussion into the open. “There is no defense today for Paul Ryan siding with the FBI and Department of Justice against those of us in the Congress who are working for transparency and accountability,” Representative Matt Gaetz told Fox Business Network’s Lou Dobbs. Whatever Ryan’s motivations, he picked a hell of a day to quit ignoring his party’s “deep state” conspiracy theories.